I've been spending a great deal of time working on making decisions for my SCA persona. I grew up within the SCA; my parents had joined when I was ten or so and were avidly involved (or at least my dad and uncles were) ever since. I didn't really enjoy much more than the clothing until I was old enough to duck out of babysitting before I was asked. I went to Great Western War this year, and despite being completely unprepared, Rosslyn and I put on a half hour show at the Open Arms Bardic Hall. I took a few classes over the weekend and in general enjoyed being there as a vacation. My parents are divorcing. I never ever thought I'd have to say those words. I am shocked and amazed by the world around me. How much joy and how much pain surrounds me on a daily basis? At the same time that parts of my world fall apart, other parts step in, strong and valiant, and buoy me up and along to safety. I love my gospel. I love my religion. Most importantly, I love my God. He provided me a Saviour and my life, wonderful friends, tough-as-nails family, and a capacity for love and compassion I am still shocked to find within myself. There's a lot of interesting articles floating around the internet lately having to do with minimizing your possessions and/or home, getting by with far less, how to shop for better deals and what one needs to truly be happy. Personally, I don't really shop much. Oh there's tons of things I wouldn't mind owning, but they are hardly "must-haves" and in the end, I'll likely never get them. At the moment, I'm working on purging myself of things I already own that I don't want or need. Besides, since I received my endowment in the temple, I've felt an increased need to get rid of material things that don't uplift me and focus on what's important. It happens once in awhile. You go about your business and trials come your way. It is through those trials you are shown your true character and begin to learn who you truly are. I've finally settled things with the DMV, now I need to settle things with the CHP by the end of the month. I'm doing what I can to handle that end, but it won't be easy. I have learned that the county Superior Court is far more friendly, helpful, understanding, and ten times more efficient than the DMV. They even make jokes about how terrible the DMV is, comparing it unfavorably with their system (which they claim is bad enough, but I saw nothing bad about it: the line was short and even the security was anything but rude). Conversely, the CHP offices (not officers) are not very helpful, but in their defense, I seem to have come in the middle of a time crisis, with every phone going off at once. I think I'll just go through the court from now on. I decided to have some fun before giving a proper, more serious update. 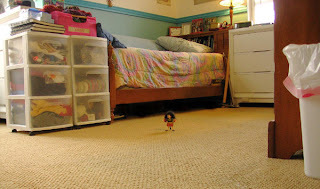 So here is my doll Briar giving a tour of my room! I'm talking in black and she's talking in purple. Hello. Can you sees me?! I's down here! This is the room! The Lady finally cleanded up in here, so I gets to show you round! Yes, those are warhammers by the bed. The Lady has strange collections. She has two real ones and one boff--boffer?--one. This is the only time we see them. Here is da other side of da room. Hello, can you see me? I'm on the candee bins! The Lady worked at a candy store and her coworkers gives them to her as presents when she quitted. Ok, over here we has the desk and then the computer thingy with the scanner and printer--oh this is funny! Time for an update! My posts seem to be much less frequent. I should attempt to remedy that. I have a lot on my mind lately. It seems almost all my trials and tribulations revolve around my car. Oh I have a parking ticket, oh they still won't send me my tags, oh I'm behind on my payments and they keep calling, oh I got pulled over, oh my car needs this, that and the other replaced, oh oh oh!! I'm tempted to sell it and have done and walk the 70 miles a day to work! Just ugh! I enjoy my car a great deal. I enjoy having the freedom to pick up and go relatively anywhere, anytime. I would like to take car of it and have it clean and well-maintained and insured and registered. But intentions aren't good enough to do all those things. They take time and money, and don't wait for payday. In fact, if one is without work for a time, they like to make things worse. Eek. Didn't post for a bit there. Whoops. I've been busy. In the last month, I've moved all the furniture in my room around and gone through a lot of things in the process (my ebay sell pile is much larger now), I've turned 25, and I've received my endowment. As that last is rather sacred, I'll let the link speak for me and suffice it to say my life is changed for the better and I've never felt so blessed. My new job is working out nicely, though some scheduling snafus on my part and my boss' part made life interesting for awhile. I turn into an instant weebly stress ball when I'm late, let me tell you! Unfortunately, working consistently puts me in the position of not caring about upkeep when I get home, so I have a messy room and bathroom. Oh well, a bit at a time and I'm done. I finally have good news on the job front!! My new company reconciled things with the hotel enough to get me a part time position (as opposed to full time). This does mean I have to reapply as a formality, but I'll be called once the job is posted so I can immediately apply and get a schedule and things. I think I can still get benefits under part time (one of my interviewers mentioned this), so I'm hopeful and gonna go with it. I'm so happy to be almost working again! I feel like a little kid. I've spent months looking for these dolls and now that I've found them...I haven't the money to get them. *sigh* For a trip down memory lane, click here. What does it say that I still wanna play with them? I still haven't started my new job. I still have no idea when I will. I received a blessing assuring me that things will be alright, but the worries and concerns are still present. As much as all this time off has done well for me in some ways, it's not been so good in others. Being stir crazy is not fun. I'm working on a doll sized chaise lounge right now to help defeat the boredom, give me a creative outlet and also have somewhere for my Khorae doll to sit and store her things (it'll have a box under the seat). My dolls have both received new faceups and new clothes, so I figured I'd spam photos instead, so here's some pretties to look at. This is Khorae with her new faceup, a new outfit removed from an antique store doll that was edited and fitted to her, and then a hat that I made myself. The pic was taken by Rosslyn in an antique store against a plaster wall relief that we were both impressed by. However, the price tag was a bit much. I'm coming to the conclusion that I'm not very self-motivated. That worries me. I don't like to do anything alone and I usually need to be prodded to do anything that doesn't yield rewards right now, such as posting something online, when it'll be weeks before anyone says anything or wants to buy it (speaking about ebay). Receiving advice I cannot immediately act on: "oh you should call such and such group, they'll help" after hours. Thanks. By the time I can call, I forget. Wow, the hits just keep on coming! I will roll with them, I swear! Last night I discovered I wouldn't be starting work for yet another week. At least. So, after an email asking for compensation or someone else to fill in on the training (my trainer has to work off-site), and then getting both options shot down this morning, I woke up a bit before seven am with diarrhea, which quickly evolved into going at both ends for the better part of the day. I had all of three crackers to eat until just now. I haven't really had much to say lately. I've been treating these last two weeks between jobs as a vacation, getting my mind in order (and my house) so that I wouldn't be a wreck with this new job and I'd be ready to learn the new things. While I'd been hoping to just jump right in, perhaps it really was better for my mental health not to. Well, the last week has been amazing. I mean, I had it completely off! This coming week, too! It's giving me time to get over being sick and rest from in between my jobs. Mentally, it's been wonderful and will continue to be so. Monetarily? Not so much, but I think I can scrape by. I'm going to visit my aunt on Thursday (technically she's my greataunt, but meh) and she's going to help me and Rosslyn learn to sew on a machine for our dolls. She's crocheted gowns for her dolls, so she's totally willing to do this. Mwahahahahaha, I didn't even know she liked dolls that much until this past Christmas. So I start my new job officially on Monday. Whatever issue they had seems to have been worked out. Unfortunately, these days off have been getting my sleep schedule all kinds of messed up, so I'm gonna try and get to bed at a decent hour (midnight) and wake up before 11 the next day. I has goals, yes. Give the world the best you have and it may never be good enough. For you see, in the end, it's between you and God. It's the time of year for making new goals and resolutions, but I've been laid up with a cold, so I'm holding off on doing the truly in depth goal making until I can think straight and have time to sit down and do it. However, one of my obvious goals--getting a new job--I've already accomplished!! I just got the call this morning and they want me to start next week! I've been really counting on this job, as it has a wage increase, hour increase, no customers and no money handling, and--and this is the good part--it has full benefits even if I'm part time. Despite my being sick, I'm trying hard not to dance around (mostly because I'd get dizzy and fall). So much for sleeping in; I'm wide awake now. Getting organized is time consuming, but I always seem to be very satisfied when I finish. My computer is currently getting wiped and reformatted, so I'm remaining on the borrowed laptop from Rosslyn for now, until my Zoro is ready (yes, I named my computer). It'll be like getting a whole new computer! Nothing beyond the OS already installed, so I get to finally put in my copy of CS2, and a couple of my games, but otherwise, brand spanking new! Rosslyn and I were on an absolute flurry of errand running today. We went to compare prices on Zoro first, got shelving units for our crafts and garage, bought cool calendars, then hit Fry's to take care of Zoro and get a few odds and ends there. We stopped for dinner and then went on a nice, gentle walk along the trails behind our development. Now I'm organizing my crafting supplies. They've been sitting in bags on the floor and it's starting to annoy me.